Trading via: Online Platform, and telephone. Offices In: UK, Spain, New Zealand, Australia. HiFX Reviews from The Web: Over 8000, mainly on TrustPilot. HiFX was founded in the UK in 1998. It was meant to be a banking alternative for white-collar individuals to cut down on the cost of sending money overseas. The company grew over the next decade-and-a-half, establishing offices in the US, New Zealand, and Australia. In 2014, HiFX was purchased by American Euronet, which is a parent company to remittance transfer service Ria. Euronet agreed to keep HiFX’s staff and branding, using the company to expand its customer base from the Hispanic immigrant population served by Ria. In the year since the buyout, HiFX’s reputation for affordable and excellent service has only been amplified, making the company one of the best currency transfer companies available on a broad international scale. HiFX reviews are generally glowing and praising the firm for its integrity and service. A company that has transferred over £ 134,549,388,534 nby itself (over 200bn combined with sister companies), 8 international offices, and has over 8000 client reviews places HiFX on the top of the scale when it comes to credibility. HiFX has some of the most glowing feedback found for any currency transfer company, in both quality and quantity. TrustPilot: 9.5/10.0 (8000+ reviews). ReviewCentre: 4.5/5.0 (100+ reviews). These are the two popular platforms for client reviews in the money transfer vertical, and we strongly rely on their feedback on our rating. Most people are every happy with HiFX’s services and all of their offerings. These people, which amount to 85%+ of all client reviews, feel they have got a great deal in terms of pricing, and receiving the service as expected. On the other hand, you can find some HiFX complaints around, some of them on the official HiFX client review pages, and some are relating to Post Office Money Transfer services that HiFX has provided until mid 2015. These people are very upset about every aspect of service, and claim they have been charged with unanticipated fees. To summarize, it seems like HiFX’s service may be inconsistent at times but it is generally good. Fees: Fees are incurred globally – £9 per transfer for all transfers below £3,000, and $15 below $5,000 in the USA. Not only this makes the exchange rates much worse for those who are looking to transfer a thousand or two (9 pounds translate to almost 1% of the funds transferred), it makes testing HiFX more difficult. If you want to learn the process and try one test transfer of £100 or £200, it will cost you dozens of Pounds to initiate it. November 2017 update: HiFX seem to have dropped their fees. This is what we see on their website anyhow, but we don’t know whether this is a global policy or only in the UK. We will further investigate the matter. Exchange Rates: It’s really difficult to say how HiFX rates compare with other companies. As with as other companies we tested, they should be able to save you 50% or more of the transfer costs in comparison with banks. The question is which rates will they will be able to offer a price that beats other companies’ quotes remains unanswered but our assumption, because of the ample size of the company, that they would be able to provide a very tight margin quote on large amounts. Limits: Very comfortable limitations online of €50 to €300,000 which makes this service available to almost everyone. HiFX is up there with the big dogs in terms of fees and exchange rates. Offices: UK, Spain, New Zealand, Australia. Translations: None but localized version for USA, New Zealand and Australia. Client reviews: Usually like the service. Users can usually get friendly, helpful service available by phone or email, with support based in New Zealand, the United States, the United Kingdom, and Australia. Personalized advisors are available for large or complex transfers. Customer reviews are very positive on this front, describing service as competent, courteous, and prompt. There are local offices for clients in various regions of the world, and they deal with more currencies than the vast majority of companies. HiFX offers only spot contracts through their web platform. All normal hedging features, including spot and forward contracts as well as stop and loss orders, are available by phone. Many of HiFX’s customers are businesses, but the company makes no special provisions for web merchants. HiFX has a currency conversion app. It works on iPhone and Android, but has no synergy with the real HiFX online platform. It feels like an attempt to get HiFX onto the common app stores and nothing more. It is rated 1/ 5 stars on the iPhone store, and damages HiFX’ strong reputation. Standard offering on hedging, nothing special for merchants (or at least not advertised) and a terrible app. How does World First match up with its possibly biggest competitor, HiFX? Why did we gave World First 97.8% on our World First review, against HiFX’s mere 80.0%? When you look at World First vs HiFX, there are several advantages that World First has in comparison, and this is why we believe it may be a better choice. World First has a “Best Rate Guarantee” for UK clients, which means the rates will always be cheaper than competitors (if you shop around). 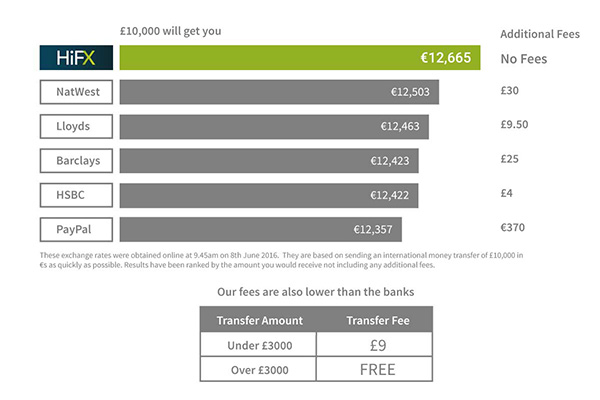 World First doesn’t levy any fixed transfer fees (with the exception of $10 for American clients for small transfers), HiFX charges £9 per transfer for all clients under £3,000. World First has been winning more impressive industry awards, and more impressive directors including the former deputy of Bank of England. World First has a more diverse offering to business clients with its World Accounts functionality. World First have the smoothest sign up process in the business. Thus, when we compare HiFX’s services to World First’s service, albeit they are very similar, we believe World First is the better options for most clients. HiFX is a very solid choice for money transfers. With 20 years in operation, 8 worldwide offices, and €100bn transferred, it is extremely reliable. Clients are consistently happy with the service they have received. The downsides? €9 in fixed fees per transfer, and a terrible app. Hifx is not a good service provider for forex. I sent the money through them – it didnt reached the recipient. They are not professional in handling any issue. customer service is very bad. Be prepared for the funds to be lost if you transact with hifx. Please which company will be best in transferring USD from Nigeria to China by using the naira equivalent on the live exchange market? Such a shame HiFX couldn’t deliever under the pressure! We told HiFX from the start we needed the transfer to happen asap as we were exchanging on a house. There were problems from the beginning. The lack of communication from them was unacceptable coming from a big company. We had to phone them over ten times, always speaking to a different person. Never told we had to verify our account until we rang them in a panic wondering where on earth our money was. Hi I have nothing to do with this company and they tried to take money out of my account never heard of them and plus I don’t even have any cash in my bank. They are crooks I have my bank investigating because it is not fair for hifx taking money out I don’t have. Seem like lots of complaints. It must have some company that better than hifx out there. We’ve been using HiFX for the past three years and we couldn’t be happier. Much cheaper and quicker than our bank would have been. The transfers have always been very easy to complete and arrived at the destination account within the time specified. We transfer to Spain regularly, so perhaps the process is much simpler within Europe. We’ve just made another transfer and were very pleased to see that the £9 transfer fee is no more!! Great service, we would thoroughly recommend. Hi guys, im looking at transferring money from China to Australia for bills etc. Easy process? Recipient had to pay $125 of hidden charges due to additional complexity from the HiFX service. This is not clear from any of the HiFX documentation and they do not accept any liability for charges imposed by other banks as a result of using HiFX. Use at your own risk. You might want to update this review. They’ve dropped their fees on lower amounts. Which currency transfer agency is better than HiFX for transferring funds from UK to US (GBP to USD)?, Please advice. I sent us dollars to China, HIFX demanded that I supply a passport number, citizens status, and copy of invoice of my supplier to them. I had no such information, why would I? It was simply a payment for goods which I was importing to Australia. I will not deal with HIFX ever again, they are weird.